Vertical louvers provide ventilation. Full-length door stiffeners add rigidity and deaden sound when opening/closing. Padlock hasp on each door. Includes number plates for locker identification. 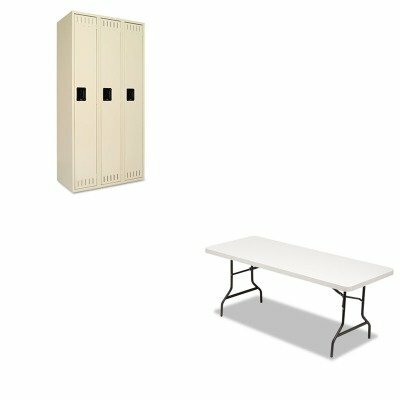 Multiple rows of lockers can be ganged with standard nuts and bolts not included. Configure with optional base sold separately to raise locker 6amp;quot; off floor for easier access to bottom unit. 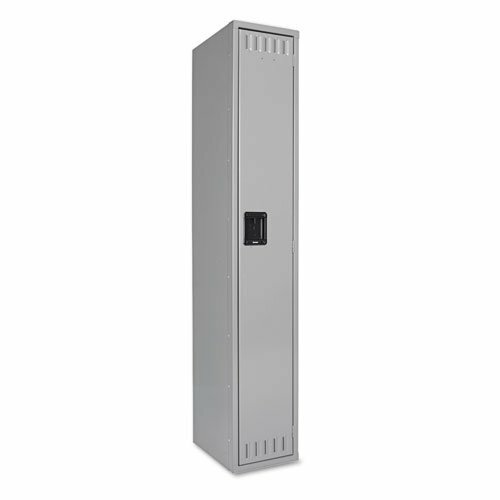 Color: Medium Gray Overall Width: 12amp;quot; Overall Depth: 18amp;quot; Overall Height: 72amp;quot;. 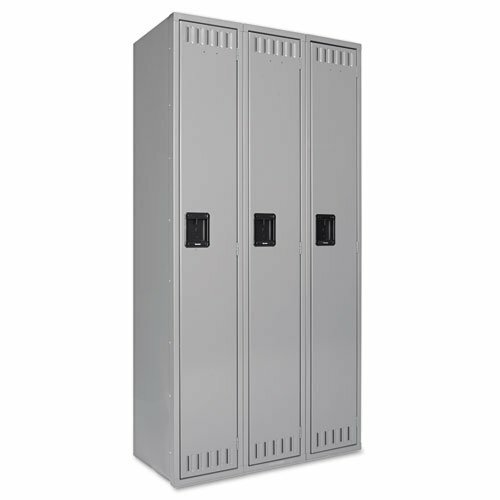 Tennsco Single Tier Locker, Three Units, 36w x 18d x 72h, Medium Gray Vertical louvers provide ventilation. Full-length door stiffeners add rigidity and deaden sound when opening/closing. Padlock hasp on each door. Includes number plates for locker identification. Multiple rows of lockers can be ganged with standard nuts and bolts (not included). Configure with optional base (sold separately) to raise locker 6" off floor for easier access to bottom unit. Color: Medium Gray; Overall Width: 36"; Overall Depth: 18"; Overall Height: 72". Padlock hasp on each door. Manufacturer's limited one-year warranty. Imperial shelving is the ideal solution for all your filing needs - especially in the office. Its unique space saving design saves up to 60 percent floor space when compared to conventional filing equipment. 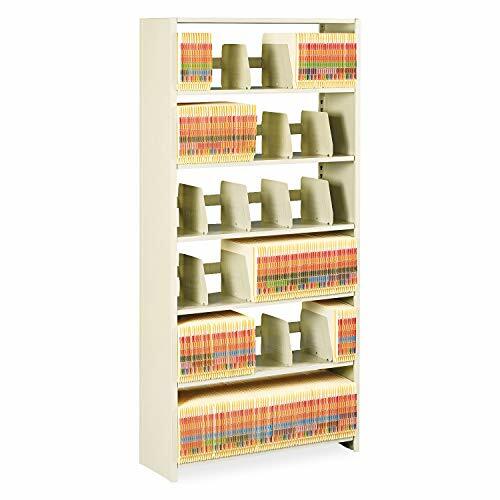 Imperial shelving can be used within the office environment anywhere tab filing is used. It makes files more visible when using a color-coding system, and more accessible by keeping them upright and orderly. All Tennsco products are proudly made in the USA. 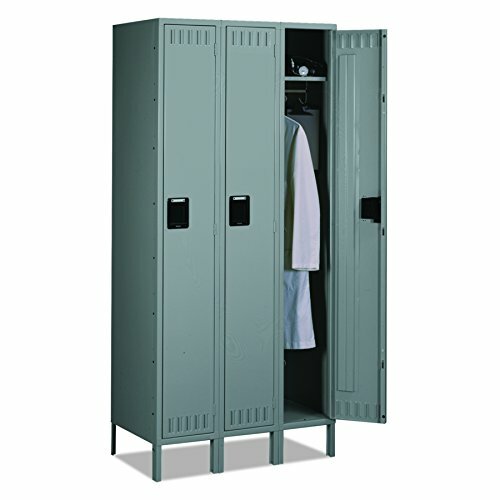 Durable, single-tier lockers with legs are made of heavy-gauge steel with tamperproof hinges. Legs raise lockers off the floor to protect contents from moisture and other elements. Each compartment measures 12 wide x 18 deep x 72 high. 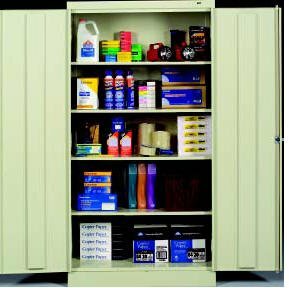 Three-point locking mechanism provides complete security to the three lockers. Number plates are included for locker identification. Vertical louvers provide ventilation. Each door has a padlock hasp. Each locker does not include a padlock. Full-length door stiffeners add rigidity and deaden sound when opening and closing. Single-tier locker also features a recessed black metal handle, hat shelf and coat rod. Multiple rows of lockers can be ganged with standard nuts and bolts (not included). lt;stronggt;TNNSTS121872CSDlt;/stronggt;lt;BR/gt;Tennsco Single Tier Lockerlt;BR/gt;Vertical louvers provide ventilation. Full-length door stiffeners add rigidity and deaden sound when opening/closing. Padlock hasp on each door. Includes number plates for locker identification. Configure with optional base sold separately to raise locker 6amp;quot; off floor for easier access to bottom unit. Multiple rows of lockers can be ganged with standard nuts and bolts not included. Color: Sand Overall Width: 36amp;quot; Overall Depth: 18amp;quot;.lt;BR/gt;lt;BR/gt;lt;stronggt;ALE65600lt;/stronggt;lt;BR/gt;Tennsco Single Tier Lockerlt;BR/gt;Lightweight and durable folding table for indoor and outdoor use. Legs fold into underside cavity for safe storage and easy transport. Made with blow-molded high-density polyethylene top is dent-, scratch- and water-resistant. Holds up to 500 lbs. evenly distributed. Square edge. Top Color: Platinum Top Shape: Rectangular. Want more Tennsco Single similar ideas? Try to explore these searches: Tears Lubricant Eye, Co2 Cartridge Valve, and Blue Skirt Suit.